The "Census Tract" is an area roughly equivalent to a neighborhood established by the Bureau of Census for analyzing populations. They generally encompass a population between 2,500 to 8,000 people. Bureau of Census describes them as "relatively permanent", but they do change over time. Therefore in order to compile data on a certain neighborhood over several decades it will be necessary to figure out the correct tract number(s) for a given neighborhood every census year. A census tract is smaller than a City but larger than a Block Group or Census Block, see this hierarchical presentation. The Bureau of Census also provides a helpful guide to Geographical Terms and Concepts. One complication is that census tracts don't necessarily follow city boundaries. 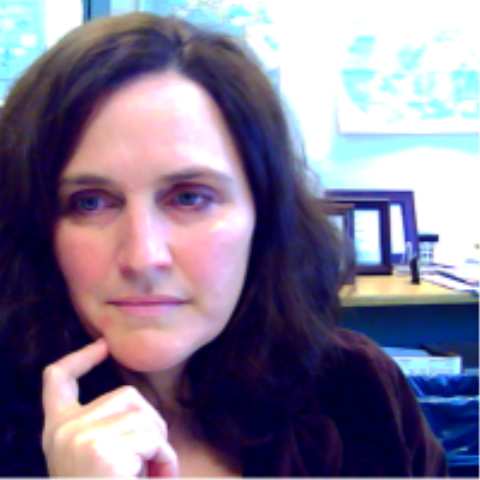 The Bureau of Census follows people rather than political boundaries. Most census tracts will be entirely within one city, but some cross over city limits and include rural land. A notable example is census tract 202.2 which is most of Delta Township, Eaton County. 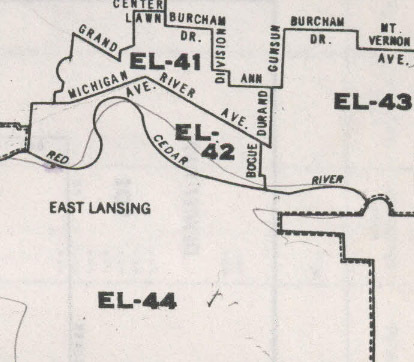 It includes the small part of City of Lansing that juts into Eaton County, plus includes a bunch of rural land too. These citations are not definitive. This is a suggestion only; you should reorganize your citation to match the style (APA, MLA, Chicago, etc.) that you are using. U.S. Department of Commerce. Bureau of Census. (1962).Census Tracts in the Chicago SMSA. Washington, DC: Government Printing Office. 1990 maps from Bureau of Census website: (linked from the "maps" tab on this guide). US Department of Commerce. Bureau of Census. 1990 TIGER Tract Outline Maps Washington: GPO, 1991. Retrieved online <insert date here> from HERE (actually in the citation you would include the whole long URL). State of Michigan. Department of Technology, Management and Budget. (2008). 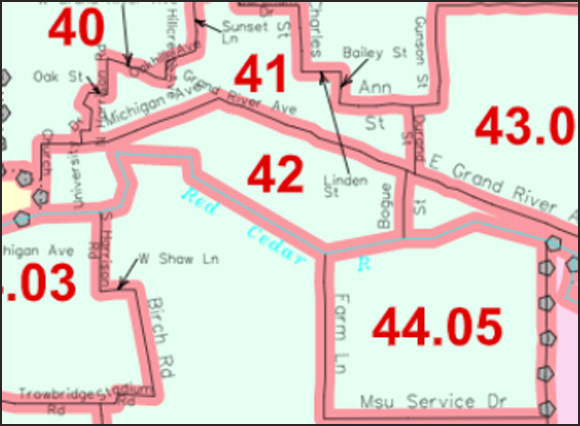 Michigan Census 2010 Block Group Series (Geographic Framework, v7). Lansing, MI: The Department. Retrieved online <insert date here> from HERE (actually in your citation you would include the whole long URL). Title of map, dates. Social Explorer, permalink URL (based on data from <identify data source>; date accessed). Race, Percent Black, 1960. Social Explorer, http://www.socialexplorer.com/pub/maps/map3.aspx?g=0&mapi=SE0004&themei=48325.2342584786.5826.008&l=-2963694.2718022&r=3672038.69056773&t=6691512.06801439&b=2838285.8360113&rndi=1 (based on data from U.S. Census Bureau; accessed 17 November, 2011). 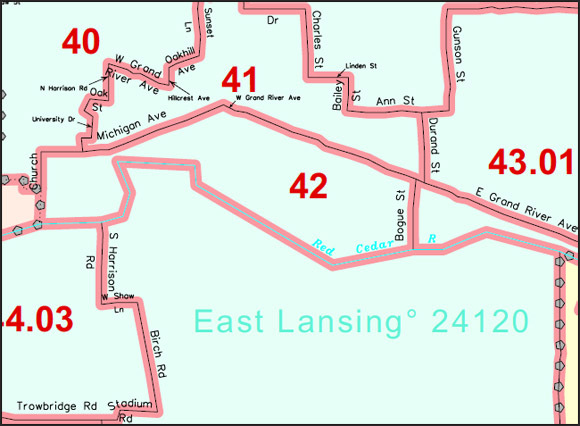 This is a small part of the tract map of Ingham County, Michigan from the 2010 census. You can see that north neighborhood is grouped with the Brody complex, except Mason-Abbot and Snyder-Phillips are in their own tract. River Trail neighborhood is in its own tract, and Holmes is with East Neighborhood. South neighborhood is in its own tract. This is a map of Census Tracts on MSU's North Campus from the Year 2000 Census, it was retrieved from Census Reference Maps You can see that people living in Snyder-Phillips & Mason-Abbot are grouped with north neighborhood and the Brody complex. River Trail neighborhood is grouped with East Neighborhood. South neighborhood is part of a much larger tract that includes non residential areas of south campus. This map shows tracts on the MSU main campus from 1990. It looks quite similar to the 2000 map. This map shows how the tracts were divided in 1960. everything on campus south of the river is in a single tract, except for the famous gun-shaped polygon that divided east neighborhood. Census Tracts were invented in 1910 and were only applied to a very few metropolitan areas. Their use has grown over time, and only with the 2000 census was every square inch of the United States put into census tracts. 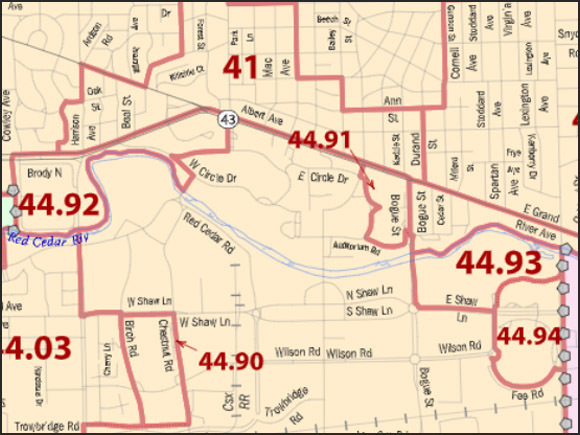 Prior to census tracts, very limited information was provided by city "Wards". 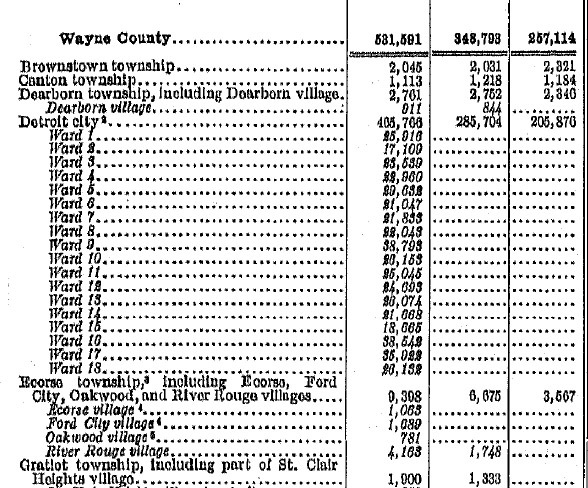 Ward level information from the 1930 Census of Population.